An Aberdeen business has won an award for the best children’s activity in the UK. 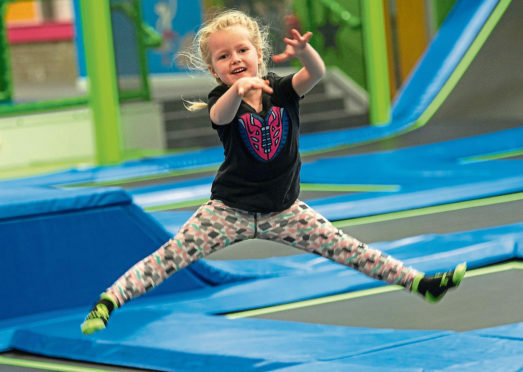 The Jump In Trampoline Park took home the accolade in the 5 to 12 year category. The park was also placed second (highly commended) in the category Best New Activity for Children. The 12th national What’s On 4 Kids Awards 2018 with headline sponsor Morton Michel was hosted by NatWest in the heart of the City of London at their 280 Bishopsgate location. A total of 70,000 votes were recorded this year, with many coming from Aberdeen and the surrounding area. Each finalist was congratulated at the UK’s leading and longest established awards for the sector. Event organisers said: “It was an exceptional year with voting very fierce across all the categories right up to the end so thanks go to the people of Aberdeen for voting in the numbers they did. “Every finalist was invited to attend the awards. Jump In Activity manager Mark Wylie said: “Activities are increasing here at Jump In, with coaching classes for all ages of children including under-5s, sensory sessions, rebound therapy, fitness classes including juniors and group sleepovers along with the many children’s birthday parties.